The album that started it all with it's lavish sleeve, synthesized swirls and 50's doo wop. The hybrid of styles and musical backgrounds of the band members created a blend of music that was like nothing that had gone before in music. This made a huge impact on the music scene in 1972 and is seen as one of the most exciting and innovative debut albums ever. 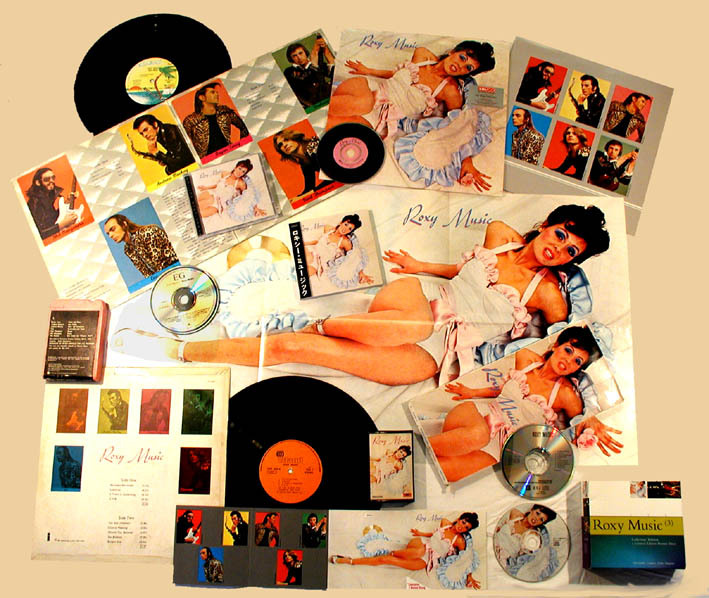 Roxy Music's eponymous debut 1st album reached number 10 in the UK album charts. From 14th -29th March 1972 Roxy Music record their debut album for £5,000 at Command Studios, London with producer Pete Sinfield. The album is mixed starting on Monday 3rd April and is finished by Friday 7th April 1972. On May 2nd 1972 Island records agree that they will release Roxy Music’s first album. The original bassist Graham Simpson is dismissed from the band between the recording and the release of the debut album and is replaced by Rik Kenton a friend of the album's producer Pete Sinfield. Roxy Music are booked into Command Studios 2PM-10PM to record their first single ‘Virginia Plain’ and the b-side ‘The Numberer’ (original title First Kiss) the session where over10th-12th July 1972 and the mixing took place one week later. The band headed from the studio after mixing the single to record a 3rd session for John Peel. This was included on the American pressings of the album. The first CD issue in 1984 included Virginia Plain. The mini LP style remasters released in 1999 kept to the original vinyl release by not having Virginia Plain, though it was included on the Jewel Case re-master. Roxy Music’s first appearance on TV is on 20th June 1972 on BBC’s ‘The Old Grey Whistle Test’ performing an extended version of ‘Ladytron’. (This is now available on the Roxy Music DVD 'The Thrill Of It All' along with a promo film of ‘Re-make/Re-model’ is shot by students at the Royal College Of Art. The debut single ‘Virginia Plain’ c/w the Andy Mackay instrumental ‘The Numberer’was released on Friday 4th August 1972 one week later than intended. The single entered the UK singles charts at number 46 on 15th August 1972 they make their first appearance on Top Of The Pops on 24th August 1972 performing ‘Virginia Plain’. The album was heading out the album charts until this point and a week after this TV performance the album headed into the top 20 for the first time eventualy peaking at number 10 on 30th September 1972. ‘Virginia Plain’ peaked in the UK singles charts to number 4 on 12th September 1972. "The album is really kind of a tracer as to where we could go," says Bryan Ferry. "There are lots of different directions there, and deliberately so, because we never really did want to have one recognisable sound. Being elusive is one of the things we quite like, and being as varied as possible. piccadilly, 1972: taking a turn off main-street, away from cacophony and real-life relics, & into the outer spaces myriad faces & sweet deafening sounds of rock’n’roll. And inner space … the mind loses its bearings. what’s the date again? (it’s so dark in here) 1962? or twenty years on? is this a recording session or a cocktail party? … on the rocks, please … where’s the icebox? … oh! now! that is … so cool … (there’d been rumours, of course, nothing certain, but the suggestion of truth). musicians lie rigid-&-fluid n a mannerist canvas of hard-edged black-leather glintings, red-satin slashes, smokey surrounding gloom … listening to the music re-sounding, cutting the air like it was glass, rock’n’roll juggernauted into demonic electronic supersonic mo-mo-momentum - by a panoplic machine-pile, hifi or scifi who can tell? Wailing old-time sax, velvet/viscous, vibrato/vicious or ensemble jamming (& more) … synthesised to whirls and whorls of hardrock sound … mixed/fixed/sifted/lifted to driving, high-flying chunks & vorticles of pure electronic wow - gyrating, parabolic, tantalising (oh notes could not spell out the score).… fantasising: phantomising: echoes of magic-golden moments become real presences … dreamworld & realworld loaded with images (of a style & time & world of - celluloid artefacts? heart-rending hardfacts?). Monaural and aureate fragments sea-changed & refined to pan, span the limits of sensation … leaves of gold, crossing thresholds & hearts. Saturday nite at the Roxy the Mecca the Ritz - your fantasies realized … & are they still? & is this the end? (or the beginning?) &, so help me, so many questions? & are the answers naked to the eye - or ear? or are they undercover?